They're at it again. Just when you thought it was safe again to go by train from Sheffield Park to Horsted Keynes, they have ripped up more old track at Holywell, but the new section has been relayed in time for normal services on the weekend of 10 and 11 March. Not content with relaying 5/8ths of a mile in Rock Cutting and Tremains during the January closure, the Infrastructure Team has been out and about in the worst of the recent weather, even laughing in the face of the "Beast from the East" when most of us were having difficulty just getting our cars out of the driveway! Fortunately, the road down to Holywell was treated and accessible if care was taken, and the team had access to the work site on days when normal working from the Salt Yard was impossible for anything else. This latest section of track had been identified as being well worn, with badly dipped joints and poor alignment south of Keysford Bridge. So without boring you with every detail, just over an 1/8th of a mile was replaced, starting where the early 2017 relaying at Holywell finished and ending just under Caseford Bridge. It is now just a matter of clearing up the site and dealing with even more old panels. Viewed from the air, the triangle at Horsted Keynes is now looking more and more like the box of Hornby Dublo you got for Christmas after you had to clear the table in time for tea. It is worth mentioning that all this would not be possible without major funding, much of which is enhanced by the efforts of those hardy rail ramblers who take part in our annual Track Trek. It has just been announced that this year's trek will take place on 30 June. After two years of the Trek taking place over the full line in November, we have decided to revert back to a shorter walk on a summer's evening when hopefully the weather is warmer and drier! So keep watching this eNewsletter and the Blog for further details as they become available, and please send email links to any friends who can be persuaded to help us with this worthy cause. This train service is by formal invitation only. The last train service from East Grinstead-to-Lewes is being re-created on 16 March, 2018, with a final stop at Sheffield Park. Anyone who travelled on the original "last train," or who knows anyone who did, is encouraged to get in touch with the Railway by email so that they can be invited to be part of this special event. The station will be open for platform admission only. Commemorating the 60th anniversary of the last train from East Grinstead to Lewes, the Railway will be turning the clocks back to the 1950s with various attractions and displays. And if you were born in 1958, you can travel at the 1958 price (20p). At Sheffield Park there will be brake van rides on 17 March on a first come, first served basis. 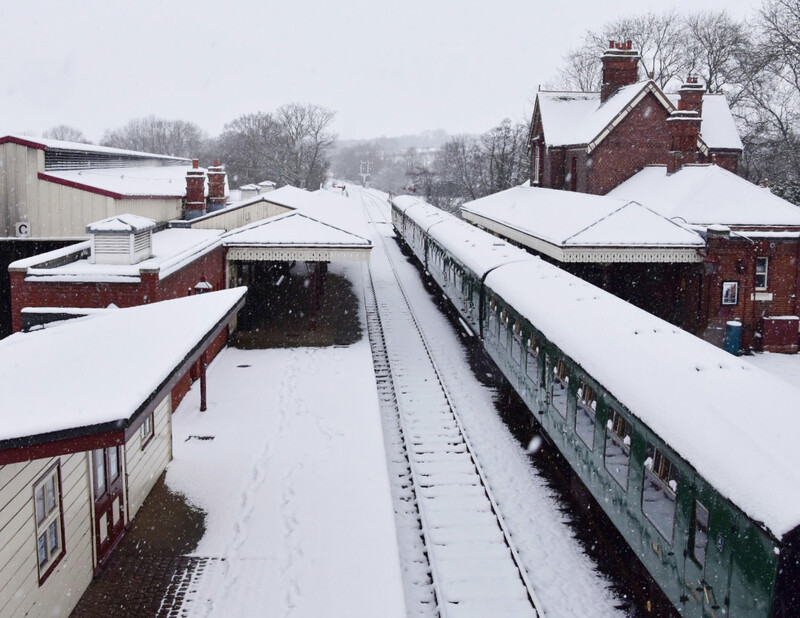 At the Birch Grove Suite, cream tea, pastries, cakes, and tea/coffee will be available from noon to 4 p.m.
Visit Horsted Keynes Station cinema room for some specially selected film footage. The Carriage & Wagon Department at Horsted Keynes will be open for guided tours. Kingscote Signal Box will be open, with limited spaces for visitors available on a first come, first served basis. To Boldly Go (to Newick)! With the 60th anniversary of the closure of the East Grinstead-to-Lewes line being commemorated on 16 March, 2018, my thoughts have turned to the question of when was the last time an ordinary passenger train departed south from Sheffield Park? Has there been one since the 16 March, 1958? While brake van shuttles have operated between Sheffield Park and the Pumphouse Siding, and a special train formed of the OBO, organised to raise funds for the Friends of Sheffield Park, departed south from Sheffield Park to both the Pumphouse and Newick sidings on the 13 July, 2013, I can find no trace of a timetabled passenger train either departing southbound from Sheffield Park or arriving northbound from the south. The 10:28, 12:28, and 2:28 departures from East Grinstead to Sheffield Park will be extended to Newick (Siding) departing from Sheffield Park, Platform 1 at 11:13, 1:13, and 3:13. The 11:30, 1:30, and 3:30 from Sheffield Park to East Grinstead will start from Newick (Siding) at 11:23, 1:23, and 3:23, arriving at Platform 1, two minutes later. Please note that passengers will not be permitted to alight or join trains at Newick. The station staff at Sheffield Park are looking forward to the novelty of announcing and despatching trains to the south and on their return towards East Grinstead. We are hoping that staff at the three other stations will make suitable announcements and display Newick destination boards for the relevant trains. However, if you know that there have been timetabled passenger trains departing south from Sheffield Park in the past, please contact me with the details. Regardless, if you travel to Sheffield Park on 17 March and remain on the train all the way to Newick (Siding) and back, you'll be able to say to people in future years that you have travelled on a train departing Sheffield Park to the south! Thank you to all those who have helped so far with our two current fundraising campaigns! The Horsted Keynes Carriage Shed (OP4) Cash for Cover Appeal has been relaunched to raise a further £125,000 for the completion of the walls on the eastern side of the shed and the Heritage Skills Centre. The Tr(ack) Action appeal is helping to accelerate the Railway's much-needed programme of track renewal. In addition to improving passenger comfort the renewed track will reduce maintenance costs on locomotives and carriages. Donate here. This year's Bluebell Railway Diesel Gala will be held over the weekend of 23-25 March, 2018. Class 45 No. 45041, Class 46 D182, and Class 31 No. 31271 will be visiting. These locos have never hauled passenger trains on the Bluebell Railway before, so don't miss this unique experience. A packed timetable with three different carriage sets. Daily brake van rides at Horsted Keynes station (with shunter D4106). An early morning Brake Van Trip (see below). A 12-carriage (loadex) train on Friday and Saturday afternoons. Harveys Brewery will be bringing its "mobile bar". A sausage and mash supper in the Bessemer Arms following the last Saturday train. Enjoy a return trip along the whole line between Sheffield Park and East Grinstead stations aboard the "Queen Mary" Brake Van No. 56290. Our own Class 09 Diesel Shunter D4106 will haul this special service, and your ticket price includes a bacon butty! This trip is bound to be very popular, so book your place now! Learn more about the Diesel Gala and purchase tickets here . Back in September 2017, Infrastructure Director Chris White hosted a meeting in the Birchgrove Suite to announce his retirement and to introduce Kevin Beauchamp, his successor. "Those of us who had volunteered most on the previous four major projects were then treated to a lunch on the Pullman," says Barbara Watkins. Chris was presented with leaving gifts by his friends on Permanent Way. "The pièce de résistance being a stunningly beautiful wood pattern, circa 1930, of a bullhead point chair," says Barbara. "Chris also was presented with a bespoke piece of engraved glass with the O.S. symbols for features found on the Railway. The glass sits in a wood-carving of a section of bullhead rail." Adds Barbara, "Chris was a good friend and the boss of infrastructure. We will miss him--his humour, his support, and his frequent visits to site night and day. Au revoir Chris, from the gang." As you have just read, last summer our long-serving Bluebell Railway PLC Infrastructure Director Chris White retired from his infrastructure role, although he remains on the Board as Safety Director. As Infrastructure Director, Chris skillfully directed the department over many years and particularly through its most significant and successful project, the northern extension to East Grinstead. Throughout his period in office, Chris brought his mainline railway infrastructure management experience and professionalism to the Railway, and the company owes a great debt of gratitude to him for his achievements. When retiring from the Infrastructure Director position last year, Chris was very pleased to know that his successor, Kevin Beauchamp, was also a career infrastructure railwayman. Kevin also had a long career in mainline railway infrastructure, culminating in the role, before his retirement from mainline work, as Head of Infrastructure for the HS1 high speed route. The staged handover from Chris to Kevin over the past six months has gone very smoothly, and I am very grateful to both colleagues for the support they have given to the Infrastructure Team during this period of change. After nine weeks, the scaffold around the Bessemer Arms is due for imminent removal. Overall, we have enjoyed reasonable weather for the time of year, and the scheme to build the canopy from the scaffold platform while causing relatively little disruption below has proved quite effective. The works have proceeded as far as was possible. The main structure is built, glazed, sealed, and flashed to the existing building, most of the guttering and trim mouldings are also in place, and everything that now remains to be done can only be achieved with the scaffold out of the way. The big reveal, with scaffolding gone, will be on 12 March, 2018! These remaining tasks include completing the valancing, guttering, and moulding trim across north gable; installing the "fifth column" at the north end (the ugly "Acrow" is only temporary measure until scaffold removal gives the necessary access); installing the cruciform column header struts; and adding the lighting. Some finish filling and paint touching-up should see the bulk of the works completed by Easter, just in time for daily running season. A last look at the glazed roof from the scaffold. Don't forget that the Grinsteade Shop and Buffet at the Railway's East Grinstead station is great way to take the weight off your feet and enjoy teas, coffees, snacks, soups, scones, bacon or sausage baps, cheesy garlic bread, and more. The Buffet is open every day, and you don't need a travel or platform ticket to hop on board the re-purposed carriage. Gifts are also on sale. "We are also able to offer the use of the Buffet for cream tea or ploughman's parties, and we are happy to entertain customer requests regarding catering," says Niki Bodkin. John Sandys' 1 March, 2018, photo shows a a few inches of the white stuff on the Railway's grounds and steel. The frigid weather conditions caused the Railway to cancel train services on 3 March, 2018. See more of John's snowy gallery below. Across the Easter Weekend (30 March-2 April, 2018), catch the train to Kingscote Station and enter a world of madness: a hatters' tea party, children's adventure hunt, giant games, small animal farm (don't forget to look out for an Easter bunny! ), and entertainment for everyone. Get into the Mad Hatter's Tea Party theme and enter the Bluebell Railway's maddest hat competition. To enter, post a photo on our Facebook page or bring your mad creation when you visit us for the Tea Party. There will be a daily winner who will receive a family ticket to the Bluebell Railway. Add to your day with afternoon tea in a themed marquee at Kingscote Station (pre-book only). Tea will include sandwiches, cakes, scones, and tea (for children a pre-packed lunch box is available). Learn more and book tickets here . 25-29 May: Visit of No. 60103 "Tornado"
Thank you to Tony Burgess, who provided a lovely, sunny photo of "Bluebell" on ambassadorial duties at the Spa Valley Railway on 26 Feb., 2018. More photos of No. 323 out and about in Kent below. Last year more than 45,000 visitors visited the Bluebell Railway Museum on platform 2 at Sheffield Park station. One of the most popular exhibits is the former Withyham signal box, which can be found at the north end of the museum. Withyham is a restored Victorian signal box. It entered service in 1866, and it was originally located on the East Grinstead-to-Tunbridge Wells line, where it saw 100 years' service. The Railway has recently installed an operating signal directly outside the box (see photo). The signal post is from a former signal on platform 2 at Sheffield Park, and most of the components are originally from the London, Brighton, & South Coast Railway. Visitors may operate the signal under supervision, and museum stewards also offer them the opportunity to undertake a full signalling sequence for a through train from East Grinstead. This exercise is both instructive and entertaining and something enjoyed by visitors of all ages! The museum is open when there are timetabled trains running. It's not the six-wheel version but a large leather bound volume of maps and plans. A "land terrier" is a system for recording land and property holdings. This new terrier is a volume of maps and land ownership created by the London & South Western Railway for the construction of the direct railway from Brockenhurst to Christchurch and doubling of the railway between Christchurch and Bournemouth. The terrier was created for the 1883 Act of Parliament that approved the new railway. It also includes details of the bridges required and shows buildings and other structures that will need to be demolished. Later expansions also have been added, including by the Southern Railway. Thanks to members of the Archive Team for funding this superb addition to the Railway's archive. To go with the Christchurch terrier addition to the Railway's archives, Tony Hillman has chosen six archive images (including one of "Blackmore Vale") from Christchurch and on the "new" line between Christchurch and Basingstoke, from the Joe Kent collection. Taken on 14 Aug., 1965. No. 34023 "Blackmore Vale" at New Milton on the Bournemouth-to-Waterloo train, operating with a modified (cut down) tender. Martin Lawrence has made a start on his March 2018 album , and has added to his February album . Is this ... spring?! John Sandys seems to think so after his latest photo shoot on 8 March, 2018. This photos shows work on the ASH Project. John Sandys caught the Railway on an evocative snow-covered day (1 March, 2018). Roger Carpenter's gallery shows "Bluebell" working hard at Spa Valley on 25 Feb., 2018. The loco will return home at Easter. If you ever have a question, comment, or contribution, don't hesitate to get in touch with me at this email address . Alan Parr: "Having published 'Great Western Steam Locomotive Panorama' in December 2016 it has since been my wish to do likewise with Southern locomotives. However, living as I do in the Midlands, I was not able to cover the locomotives on the Bluebell Railway without which no collection would be complete. "That was resolved a few months ago when I was contacted, on a totally unconnected matter, by Member Bob Kershaw. It became apparent that he would be able to fill the gap with material that he had already shot plus a visit to Atlantic House to film 'Beachy Head' that was kindly arranged through David Jones. The material was now available for me to complete my project. 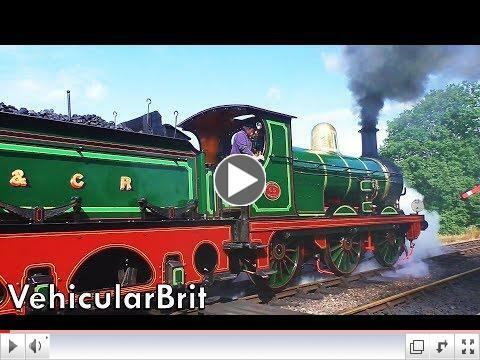 "This video brings home how fortunate we are in the UK to have such a huge stock of steam engines. In the video, we see 44 locos of 20 different classes in 179 clips from the Southern Railway alone, and this is by no means a complete coverage of that railway system. Included are stills as well as video shots that I hope you will find entertaining. 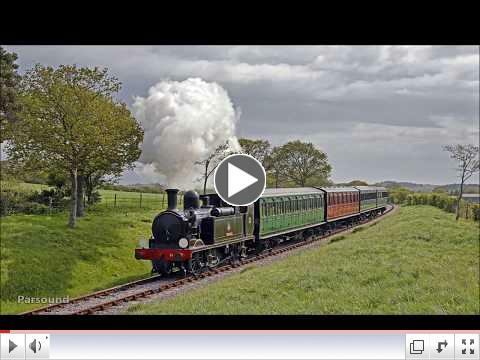 "I am grateful to the fellow enthusiasts who have kindly let me incorporate their material, and Steve Downs for his permission to use the delightful music"
The Great Western Steam Locomotive Panorama can be seen here . In Mike Hopps' infrastructure and track re-laying update in the previous issue, the text should refer to: "110 lengths of 60-foot rail were set on 1,540 concrete sleepers, which were held in place by 6,160 'pandrol' clips and plastic 'biscuits'. " The locomotive Yard and ash plant at Camden, 1939 . "View SE towards the shed itself. The locomotives facing are Fowler 'Patriot' class 5XP 4-6-0 No. 5504 'Royal Signals' on left, Fowler 'Royal Scot' class 6P No. 6161 'King's Own' on right." The next illustrated talk by Geoff Burch has been re-scheduled to 10 April, 2018, at St. Leonard's Church Hall, Cambridge Road, Horsham RH13 5ED, starting at 7 p.m. This fully illustrated talk offers insight into Geoff's varied railway career on the Southern region, including work with EMUs and diesels. The talk is accompanied by exclusive selection of photos presented on a large screen. Entry is by ticket only, £3 per person, available from the Horsham Museum, Causeway, or on the door. The ticket includes light refreshments. ALSO ... Horsham Model Railway Club (HMRC) will host an open day on 7 April at St. Leonard's Church from 10 a.m. to 4 p.m. There will be eight layouts. Entry fee is £1. Thinking of becoming a Permanent Way volunteer? This webpage is for you ! Undeterred by the weather, on 2 March, 2018, the cylinder block castings for SECR P class No. 27 were driven up to Statfold Engineering Ltd for machining. This photo shows them loaded up ready for the journey. 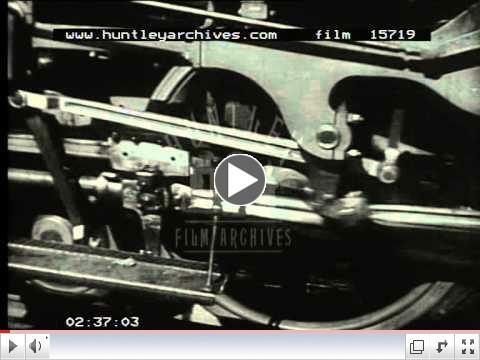 System for mounting an electric traction motor in bogie. One end of the motor is attached to the axle it drives by two suspension bearings, while the other end is hung off the bogie transom plate at a single point by a bracket. 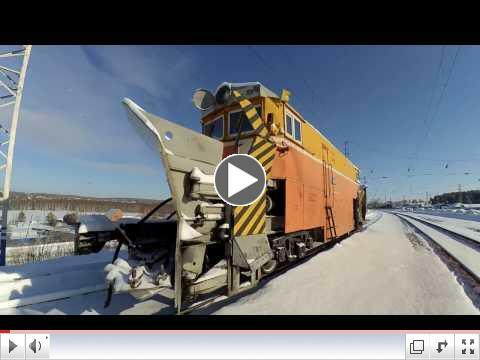 The recent wintry conditions in England and Europe is another opportunity to see how snow removal is managed on a railway that measures its snowfall in feet: the Trans-Siberian Railway in Russia. Mark Duhig made an inspection of Sharpthorne Tunnel on 3 March, 2018, and found some spectacular icicles, despite the shielding put in place to divert the worst of the water that flows continuously from the tunnel roof. Mark reported that the largest icicles were 10 feet long and up to 5 inches in diameter. Barmouth Station in Great Western steam train days with family on holiday in Wales (1960). VehicularBrit: Tired of winter? Sit back and enjoy a hand picked selection of clips from the hottest and brightest days out on the railways of the south in 2017. Thanks to @shapeways for the delivery of Mark 2 prototype (I dropped the first one) the LNWR Observation car as seen @bluebellrailway hopefully I will make this available soon.